We are on our third winter season with our KOZI pellet stove. In my search for heat self-sufficiency, I looked into various options such as wood and pellet stoves. Before purchasing a pellet stove, I relied on a propane furnace and electric baseboards. While wood seemed like a great way to go, being home by myself with little ones during the winter means handling firewood and tending to a fire would require a lot of work on my part. Pellet stoves burn pellets made of compressed wood byproducts. I am sourcing pellets locally from Hammer Pellet Fuel Company located in Kenova, West Virginia. The pellets are made from clean sawdust, a byproduct from their lumber operations. Typically, purchasing pellets is slightly more expensive compared to purchasing firewood, but having a source so close makes the price fairly comparable. The pellets are compact and easier than firewood to store and I keep two tons stacked in our basement adjacent to the stove. Pellet stoves provide the convenience and easy of use comparable to a gas or electric system, but are a little more hands-on. 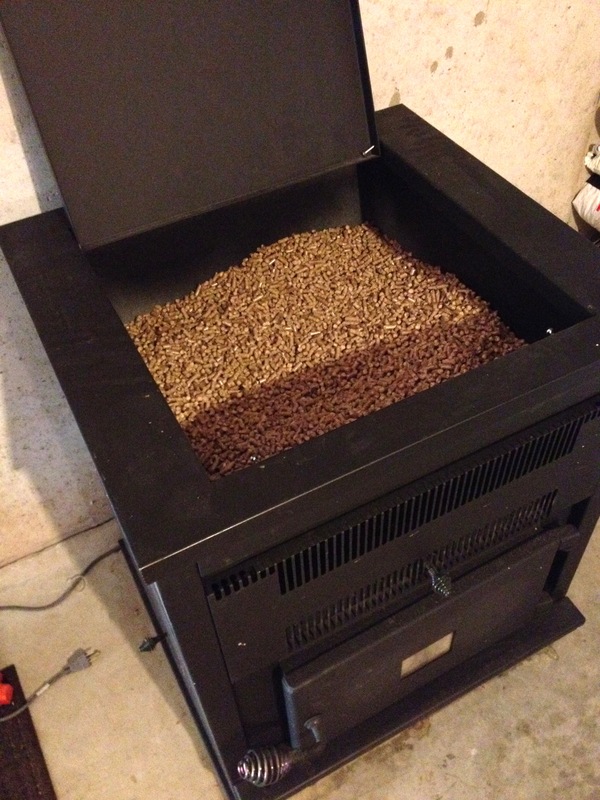 While pellet stoves do require daily tending, in my situation it is much more manageable as I can simply fill the hopper in the morning and leave it virtually unattended. Getting a pellet stove to burn and feed properly does take a little touch, but I have found that once I get it fired up at the beginning of winter it operates smoothly for the season. One tip that I would pass on to those looking to purchase a pellet stove is to burn quality pellets; this has helped our stove burn more effectively and efficiently. At around 40,000 Btu/hr, the addition of this pellet stove to our walk-in basement keeps it warm and helps heat our first story. This has greatly reduced our reliance on propane. Pellet stoves do require regular cleaning. My cleaning routine includes emptying the burn pot and ash drawer out about once a week and I do this by letting the fire burn out, the stove cool and then simply vacuumming it out. Other parts of the stove such as the hopper, auger, heat exchanger and glass need to be maintained less often and I tend to tackle those projects at the beginning of the season and then again a couple of months in. One downside to pellet stoves is that they require electricity to run properly. I currently have a generator and also hope to purchase the battery backup system specific to the stove soon. Total cost to install our stove was around $2,500, which included installation and a skid (a ton) of pellets. Set on low, which produces an adequate amount of heat, the stove is burning just under a bag of pellets a day. During the summer, we purchased two tons of pellets for around $200 per ton and these should last us beyond the winter. While our pellet stove doesn’t provide us with the complete self-sufficiently that cutting and burning firewood would, I am very happy with our choice. Anyone else have experience with pellet stoves? What do you think? The pellet stove refered to in this post is a KOZI Shop Heater Pellet Burner Model KSH-120. For more information: http://www.kozistoves.com. Want to learn more about the pros and cons of wood pellet stoves? Check out this article from Mother Earth News. Great post. I also have a Kozi KSH 120, a few years old. It came with the house. I would not recommend it. Why? It dies all the time. Why? Because it’s delicate. When it isn’t set up properly, the gasket is a little loose, the ashtray not perfectly sealed, it may LOOK like it’s operating properly, but you end up with very little warmth, a lot of cleaning to do, and a huge electricity bill. I’ve spent hours, more than I care to remember, cleaning, tweaking, researching online. My hands are black and cut up and I am fed up. -You need to lug a LOT of pellets. A LOT. Like literally, 5 tons a year, 40lbs at a time. -When the power goes out, so does the heat. -Parts and experts are not easy to find. Bottom line: If you can afford a different kind of heat source, even a high efficiency wood insert, go with it. Pellet stoves are the payday loans of home heating: Quick and EZ to get, but cost you a lot more grief than they’re worth in the end. So far I have been pleased with our Kozi. Wood was my first choice; however, at this point cutting and hauling wood by myself is unrealistic. Our stove is located in our basement and keeps the floors and first level much warmer. This winter has been brutally cold and we are going to go through two tons of pellets versus just one the last few years. We have been struggling with some the issues you mention though. First, the stove has been going out very frequently, which we assumed what due to “dusty” pellets. We are using the same brand and hadn’t had this probably previously though. Another thing we are noticing is that the ceilings in the house look sooty. Very sooty. Thank you so much for reading my blog and commenting!